International investment in renewable energies reached $286 billion last year, double that of fossil fuels even as prices continue to tumble. Jobs in the renewable energy sector (not including large-scale hydropower) increased in 2015 to an estimated 8.1 million, according to the 59-page Renewables Global Status Report, generated by the Renewable Energy Policy Network for the 21st Century (REN21). In parallel with growth in markets and investments, 2015 saw continued advances in renewable energy technologies, ongoing energy efficiency improvements, increased use of smart grid technologies and significant progress in hardware and software to support the integration of renewable energy, as well as progress in energy storage development and commercialization. For example, Tesla began shipping its Powerwall lithium-ion home batteries to customers -- the first of more than 500,000 batteries it expects to make at its Gigafactory outside Reno, Nev. The company is also producing a commercial-grade battery called the Powerpack, each of which will allow businesses to store up to 100 kilowatt hours of power. And, after 16 months of development, Boeing delivered a "reversible" fuel cell for the U.S. Navy that stores energy from renewable sources and generates zero-emissions electricity. 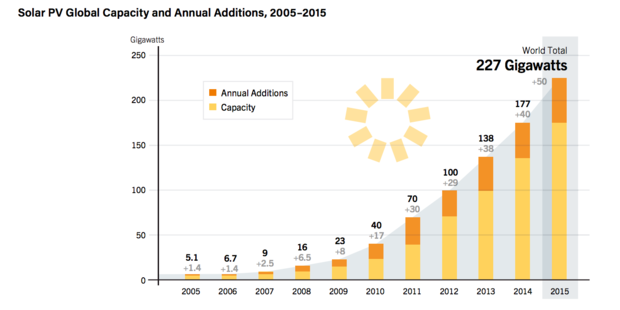 Solar photovoltaics (PVs) and biofuels provided the largest numbers of renewable energy jobs, according to the report. Large-scale hydropower accounted for an additional 1.3 million direct jobs. Considering all renewable energy technologies, the leading employers in 2015 were China, Brazil, the United States and India. "Renewables are now established around the world as mainstream sources of energy," the report said. "The world now adds more renewable power capacity annually than it adds capacity from all fossil fuels combined." At the end of 2015, renewable capacity was enough to supply an estimated 23.7% of global electricity, with hydropower providing about 16.6%, according to the report. The rapid growth in renewable power is being driven by the improving competiveness of renewable technologies, dedicated policy initiatives by governments and better access to financing. Based in Paris, REN21 is a consortium of more than 55 government and non-governmental organizations, research and academic institutions, and industry players whose mission it is to advance renewable energy. Among the most rapidly growing renewable energies was hydroelectric power. More than a terawatt (a trillion watts) of hydroelectric power was added in 2015. Investment in renewable energy, however, has been weighted increasingly toward wind and solar power. 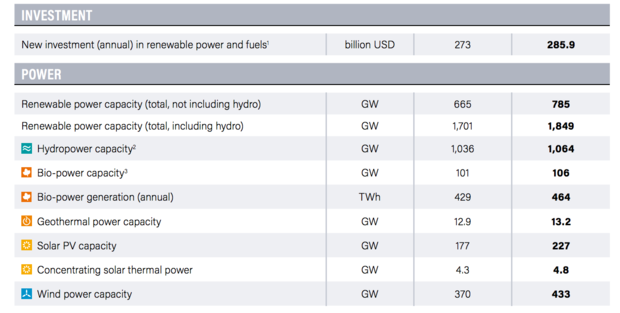 Last year, wind power saw an additional 63 gigawatts (gW or a billion watts) of capacity, bringing it to 433gW worldwide. "Wind power was the leading source of new power generating capacity in Europe and the United States in 2015, and the second largest in China," the report said. 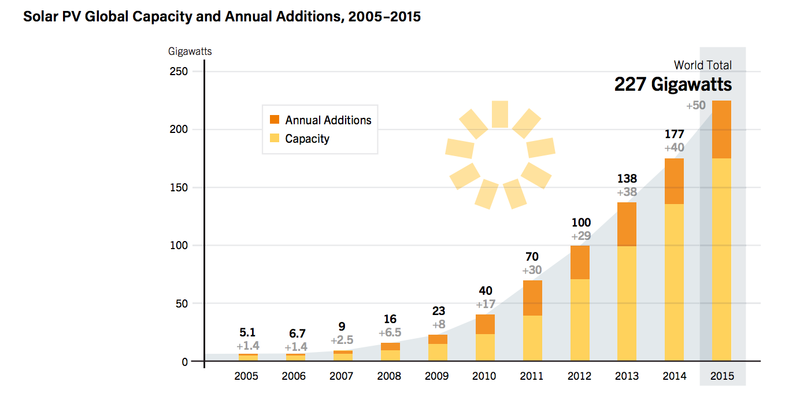 Solar power installations increased by 50gW worldwide last year. In 2015, solar power was again the leading sector by far in terms of money committed, accounting for $161 billion in investments (up 12% over 2014), or more than 56% of total new investment in renewable power and fuels. 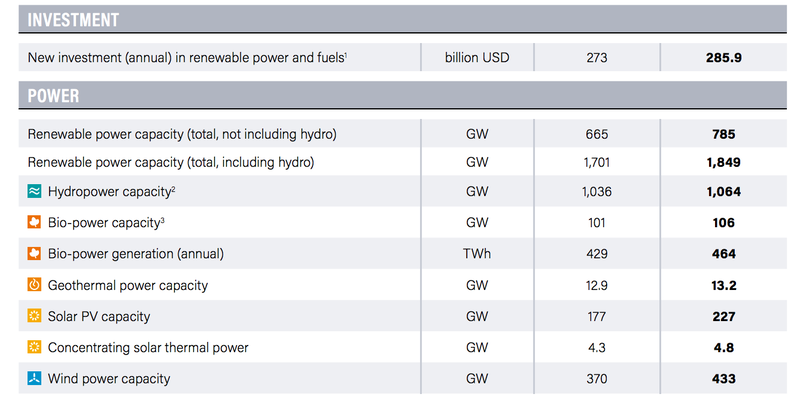 Wind power followed solar with $109.6 billion, or 38.3% of the total investments in renewables (up 4%). All other renewable technologies, however, saw investments decline compared to 2014: investment in biomass and waste-to-energy fell by 42% to $6 billion, small-scale hydropower fell by 29% to $3.9 billion, biofuels fell by 35% to $3.1 billion, geothermal energy fell by 23% to $2 billion, and ocean energy fell by 42% to $215 million. Global investments in renewable energies. 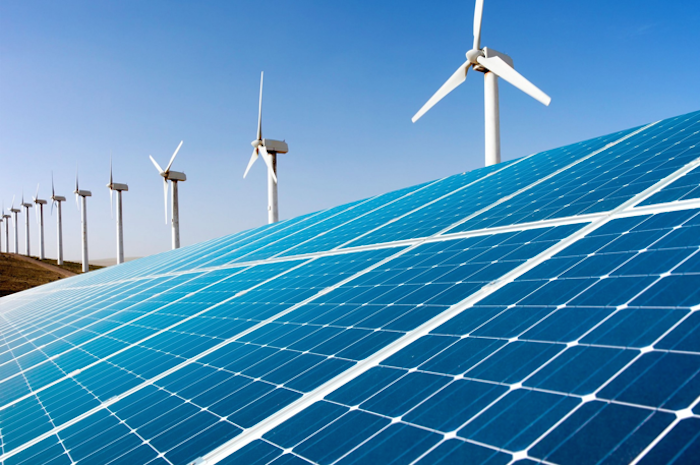 "Private investors stepped up their commitments to renewable energy significantly during 2015. The year witnessed both an increase in the number of large banks active in the renewables sector and an increase in loan size, with major new commitments from international investment firms to renewables and energy efficiency," the report said. Governments throughout the world are also enacting policies promoting renewable energy. More than half of all nations -- 110 countries out of 196 countries -- now have some type of renewable energy policy in place. And at least 128 countries have enacted one or more energy efficiency targets. Last year saw many high-profile agreements and announcements related to renewable energy, including commitments by both the G7 and G20 nations to accelerate access to renewable energy and push for energy efficiency. Additionally, the U.N. General Assembly adopted the Sustainable Energy for All goal. The Renewable Global Status Report also called for fossil fuel subsidies to be phased out, "as they distort the true costs of energy and encourage wasteful spending and increased emissions. "Fossil fuel subsidies also present a barrier to scaling up clean energy by decreasing the costs of fossil fuel-powered electricity generation, thereby blunting the cost competitiveness of renewables," the report said. Fossil fuel subsidies were estimated to be over $490 billion in 2014, compared with subsidies of only $135 billion for renewables.